Blow up some balloons to your desired lantern size and cover each one with petroleum jelly. Coat your twine in a mixture of white glue (4 ounces), cornstarch (1/2 cup), and warm water (1/4 cup) and wrap around each balloon. Let dry, then pop the balloon to reveal your lantern. Repurpose an old or broken hose and turn it into an outdoor rug. Just get yourself a bag of zip ties and as you coil the hose around, use the ties to secure two rows together every six inches or so. Add a pillow to your favorite beach towel! Simply sew a small towel into a pillow case and stuff with fabric stuffing. Sew it closed, then attach it to your favorite beach towel with a sewing machine or needle and thread. Roll the towel up around the pillow and you’re ready for the beach. Jazz up your outdoor party with a homemade banner. Simply gather up some colorful bandanas, fold each one in half, and cut a triangle out. Glue the ends of the triangle together and string twine through the folded end to create a banner. If you have some leftover fabric scraps, you can create your own lavender-filled sachets to keep your dresser drawers fresh. Simply place the lavender in the middle of the fabric, gather up the ends, and put a few stitches in them to secure. Cover the stitches with a button to finish. Grab a couple metal lanterns from a craft or thrift store and paint the metal material your favorite color. Then, measure the glass panels and print out fun photos of the same size. Attach the photos to the glass and use a battery-operated candle to illuminate them. 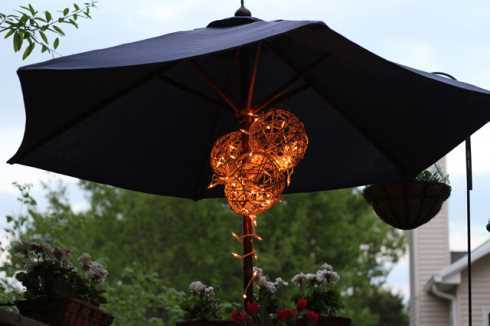 To make this, simply buy a large paper lantern and a few dozen paper drink umbrellas. Spray the entire lantern surface with adhesive and poke your umbrellas through the paper until they sit flush on the surface. Cover the entire lantern for a fun look. For a touch of vintage decor, grab a large paper mache letter from the craft store and cut off the front. Paint the whole letter your favorite color, then glue 1-inch gold or silver Christmas ornaments along the inside to mimic old light bulbs. Cut out some squares of cardboard (your coaster template) and flatten out several colors of drinking straws. Cut them to the size of the cardboard and tape them down side-by-side. Use a different color straw to weave through the ones that are taped down, then finish the coasters by lining the edges with duct tape in a coordinating color. Spruce up some plain glass pillar candle holders by wrapping twine around the bottom half. Glue to secure, then add a bow, seashell, or other decoration as a finishing touch. Place a candle inside and light. Grab a plain colored straw mat, some outdoor paint, and a sponge or paint brush. Paint a quote, design, or pattern onto the mat and let dry. Finish with clear, waterproof spray paint. Turn old aluminum food cans into your own countertop herb garden. Simply remove the labels and drill several holes in the bottom of each can for drainage. Then, plant fresh herbs in each can and assemble them on a large terra-cotta plate. All you’ll need for some fun luminaries is a few narrow pool noodles, some scissors, and some battery-operated candles. Simply cut the noodle into 1 1/2-inch pieces and insert a candle into each one. Then, set up along a wall or deck. Turn your favorite pot into a work of art. Cut strips of colorful fabric and use waterproof glue to attach them to your pot. You can line them up vertically or horizontally or criss-cross them for a fun effect. Grab a wire wreath frame, several dozen clothespins, and some paint. Paint the clothespins whatever colors you desire and let dry. Then, clip them onto the wire frame for a simple and fun summer wreath. For your next barbecue, grab some Mason jars and some paint and create some colorful utensil holders. You can either paint the inside of the jar or the outside, depending on the look you want. Grab some plain white pillowcases and turn them into watercolor works of art by coloring in areas of the fabric with colorful Sharpie markers. Fill a spray bottle with rubbing alcohol and spray the fabric until it’s saturated. Once dry, iron them to set the color. For easy kitchen trivets, gather up some natural rope, round wooden plaques, and heat-resistant adhesive. Spread the glue onto the wooden plaque and starting in the center, coil the rope around until you reach the outside. Let dry. Create your own chalkboard sign with chalkboard paint and a piece of wood in your choice of shape and size. Simply give the sign a coat of paint and let dry. Then attach ribbon or strings and hang! Add some fun to summer reading. Wrap your favorite colored yarn around two of your fingers about 90 times, then remove and string a piece of yarn through the center. Tie it, then leave a yarn tail of about 12 inches. Cut the looped ends to create your pom pom. This entry was posted in DIY and tagged crafts, DIY, summer, yarn.